This is an extended version of a post originally published to AdExchanger. If you haven’t heard yet, restrictions regarding autoplay and inline video will be lifted in Safari for iOS 10. Google is following suit with the same relaxation of the rules in Chrome 53 for Android. 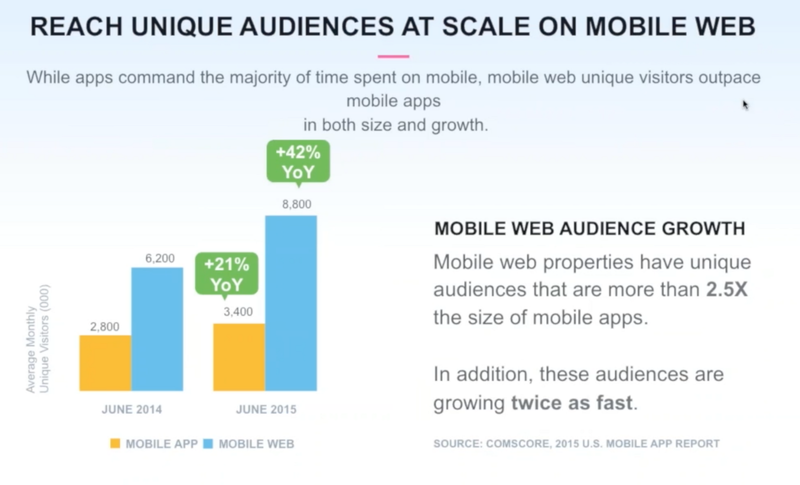 These moves open up a huge opportunity for mobile web video to explode. Check out my previous post on the subject if you want more context regarding the situation. The new rules of mobile web video are a potential saving grace for publishers looking to create new unique mobile video inventory. They also may be a boon for independent ad tech companies that find themselves locked out of the walled gardens that dominate mobile apps. The problem is that all their time is spent behind walled gardens. 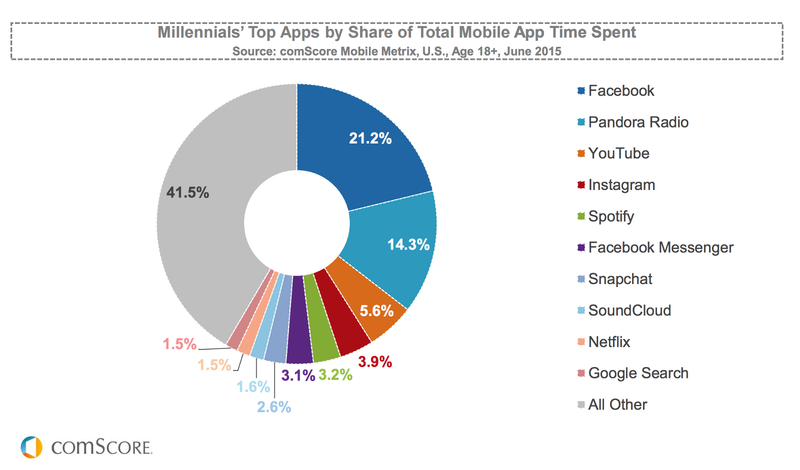 The harsh reality is that apps like Instagram, SnapChat, Facebook, Facebook Messenger, YouTube and Twitter eat up the majority of users’ time. 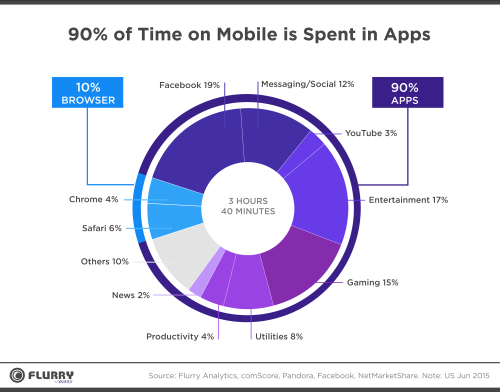 Every app outside that gray area could be considered a walled garden — meaning the majority of the inventory is directly sold by the respective platform. That sizable gray chunk might seem like a tantalizing opportunity for an ad tech company to wrap their tendrils around, but upon further consideration it is just as inaccessible as the other slices of the pie. Complex SDK sales cycles and even more complex integration processes create substantial obstacles blocking direct access to that supply. The future of in app advertising looks pretty bleak for independent ad tech companies. Swaths of audience are being cut off and removed from the potential supply pool by massively popular social, entertainment and messaging platforms. App consolidation is a real threat that should not be taken lightly. We even have what some may consider a doomsday scenario looming in China. WeChat has amassed 761 million active users since it launched in January 2011. You can compare that to 1.71 billion monthly active Facebook users. But the difference of WeChat is that Chinese users spend the majority of their time inside this one app. WeChat is considered a “swiss army app” or “super app” because users can do everything inside of it. Despite the name, people do much more than chatting in WeChat. It can be seen as Facebook / Venmo / Apple Pay / Yelp / Uber and much more rolled it one app. This video by The New York Times does a great job explaining what WeChat is. Although I cannot find concrete stats for time spent in WeChat, we can make some assumptions of usage based on this January 2015 report that shows that WeChat gobbled up 27.7 percent of mobile data volume of Chinese users. This must have executives at Facebook and Snapchat salivating, but also quaking with envy. This doomsday scenario for independent ad tech companies is a dream scenario for companies like Facebook and Snapchat. If they successfully emulate the model WeChat brought to China in the United States then their walled gardens becomes more like a walled fortresses. Couple that with the already difficult task of landing direct ad SDK integrations on apps with actual scale and the walls get even higher. But luckily there’s still the mobile web which has a larger total audience, is growing faster than mobile apps and is completely open to all players. Now that videos can play inline (outside your phone’s native player) and without direct user interaction — publishers can replicate the same type of video content and ad experiences that are propelling SnapChat and Facebook into the stratosphere. The core business strategies of Facebook and Snapchat now revolve around video. They are setting the status quo of video ads in our increasingly mobile world. New rules of video advertising are being written through these companies’ ongoing experimentation with video. The good news is that we can all benefit from their experiments. We can carry over their best practices and piggyback off their education of advertisers on new mobile-specific video formats. Vertical video was once the bane of video viewers around the world; now it is one of the hottest new video creative types available to marketers. Beautiful full-screen visuals captivate viewers and don’t require the added physical action of rotating our devices. It is actually very surprising that vertical video took so long to gain traction given how logical the format is for mobile. According to Snapchat, users are 9x more likely to watch an ad to the end if the video creative is in vertical format. They also report that their “swipe up rate” (this is how users learn more about the ad) is “5x higher than the average click-through rate on comparable platforms”. 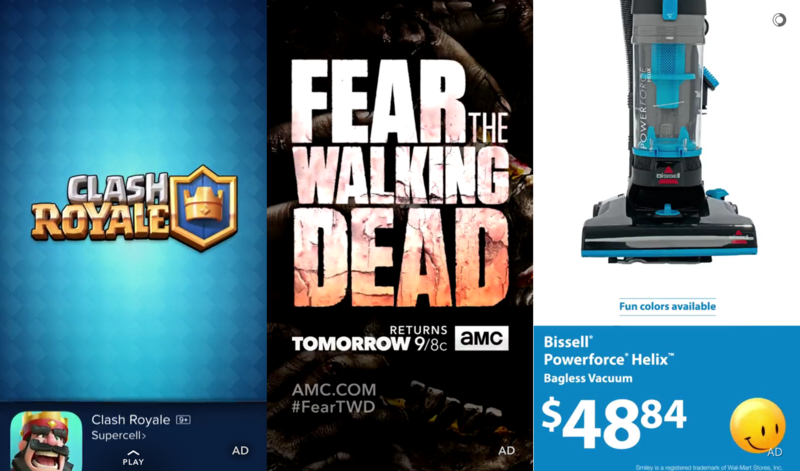 What do Supercell, AMC, and Wal-Mart have in common? They are all vertical video buyers. Given metrics like this I would expect vertical creatives to start trickling down from direct Snapchat buys into programmatic channels wherever available. Naturally we would see these vertical ads in other mobile apps but with the new autoplay and inline mobile web rules, we can replicate the native experiences required to create vertical “snapchat-like” experiences on mobile web. Since developers can now control the video playback experience, we can add gestures and interactions that Snapchat has ingrained into users’ minds. Autoplaying video, swipe to next video, swipe up to learn more and tap to next video are now achievable in a mobile web playback experience. While these new changes may seem trivial to most people, it is a whole new world for interaction designers working with video like myself. There’s a reason Snapchat has had a meteoric rise in popularity. The company introduced tactile and natural ways of interacting with media never before seen in any other format. Now we can start to figure out how these new mental models instilled in users can create a more intimate experience on mobile web. A new trend emerging on the coattails of the recent explosion in VR innovation is 360 video. This format is often confused with virtual reality but there is a very important distinction between the two. VR creates an actual three dimensional virtual environment that the user can interact with in real-time while 360 video is for all intents and purposes, just a video. 360 videos are either digitally rendered (in animation like the screen grab from a Clash of Clans ad below) or recorded using an array of cameras all shooting footage simultaneously. These recorded videos are then digitally “stitched” together in post-production to create a spherical video that wraps around viewers. This sphere can only be fully realized either in a VR headset or with a mobile phone or tablet that contains an accelerometer to detect the orientation of the device. You can still view 360 video in desktop capable players, but clicking and dragging to look around does not provide the same immersion of actually physically looking around. At Beachfront Media, we are already hard at work developing 360 video solutions for publishers. 360 video was introduced to the masses by Google last year when they rolled it out to YouTube. Shortly thereafter they opened up the format to advertisers. Not to be outdone by one of their arch rivals, Facebook rolled out 360 video support on their platform. Both companies are vigorously pursuing VR technology. Facebook acquired the catalyst of the second coming of VR, Oculus, in March 2014. At Google I/O in May 2016, Google announced an entire VR-focused platform called Daydream and announced stringent “Daydream ready” specification guidelines for manufacturers looking to create VR-capable phones. Even though both of these mega-companies are vying to create the VR platform, they still have to focus on the near term. This is why 360 video is so interesting. 360 video is accessible to any smartphone user and does not require a VR headset and is supported in both the YouTube and Facebook apps on iOS and Android. The exciting part is that we can now bring 360 video to mobile web. The opportunity for 360 at scale on mobile web becomes even more interesting when you realize that existing programmatic video ad infrastructure is already capable of delivering 360 creatives. After vertical and 360 video, talking about outstream video seems like quite a boring prospect; but given the rapid rise in popularity of this format, it must be addressed. The term outstream has become somewhat of a misnomer recently. Outstream originally meant any video not running in-stream — like sliders or interstitials. But now when you think outstream you think of the videos that magically appear in between paragraphs of text on desktop web. At Beachfront we are solving inventory creation and viewability problems with our 100% in view mobile outstream units. Teads brought this format mainstream and made it their bread and butter. I guess it’s working because investors are continuing to throw money at them to the tune of $127 million according to Crunchbase at the time of this writing. They recently unveiled a mobile outstream unit that skirts current mobile browser restrictions of autoplaying inline. This clever trick of engineering to circumvent the rules have made them the current go-to mobile outstream provider. They have even announced a 360 mobile outstream player — although there is currently no demo available. Even though Teads is an early mover here, the relaxation of mobile web video rules will allow many new players to enter the space. Most independent ad tech companies simply do not possess the resources (Teads employs 450 people) to achieve such technological circumvention voodoo. But now new players are permitted to enter the game. 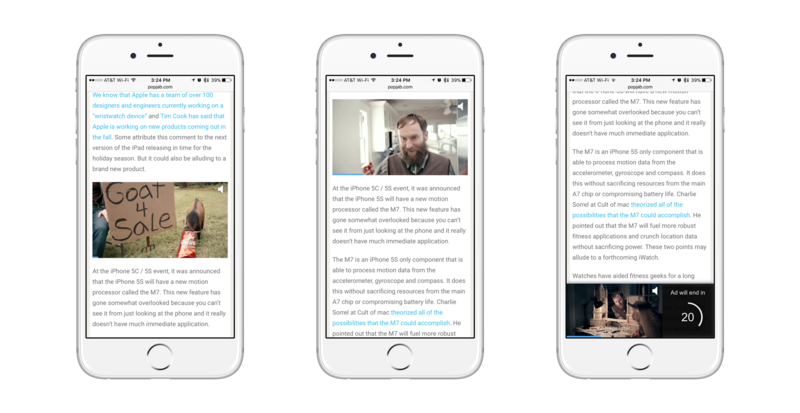 The new rules regarding mobile web video are set to be unleashed by Apple with the release of iOS 10 some time in mid-September and Google’s Chrome 53 for Android may drop before then. So what should we expect to happen as a result? We will see a land grab by ad tech vendors looking to create unique video inventory on publishers’ properties. 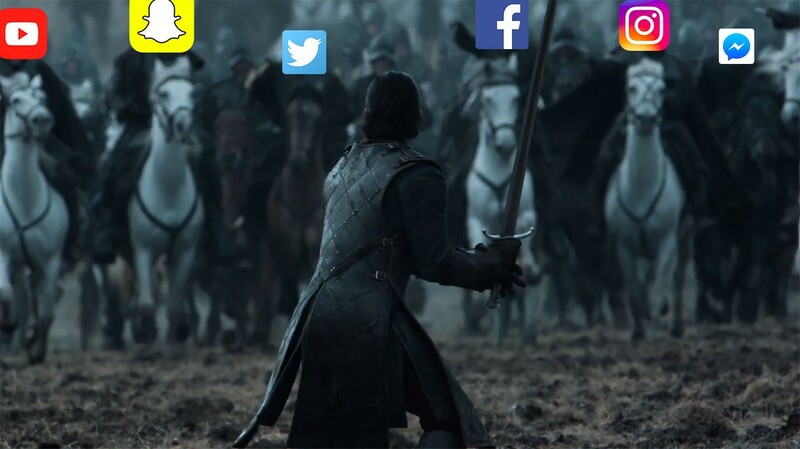 They will be clawing for publishers and hawking their own new unique units designed to create mobile web video inventory. Teads will now have company. There will be a sharp rise in available mobile web video supply. Video will be able to autoplay so of course we will start seeing many more requests for impressions. VPAID JS might actually catch on. Like a bad rash or crazed ex-girlfriend, Flash refuses to go away. It continues to hang around for desktop video advertising despite the anticlimactic Flashpocalypse last year. If the new rule changes on mobile web do usher in the new era of web advertising, then expect to see demand partners push hard for VPAID JS since it is the only way they can track performance themselves and use their verification partners like MOAT, White Ops, IAS, Double Verify etc. Mobile web autoplay and inline video opens a big window of opportunity for ad tech vendors and publishers. I would recommend following the developments of all the trends I mentioned very closely if you are involved in the video ad industry in any capacity. Entirely new playing fields do not open very often in digital media so don’t miss your chance to enter the game.